Just over a year ago, I converted Reef’s Take which was just a blog at first to a multi-person internet sports media company known as Crossroads Sports. We have included podcasts and Facebook Live shows and included Bracketology specials over the years. We still have a long ways to go still to get where we want to be, but we are introducing another new platform that is interactive and fun and that is the new internet radio sports show. 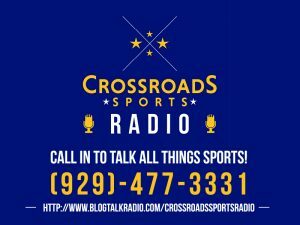 Crossroads Sports Radio will now be on BlogTalkRadio.com website and streamed over other platforms including TuneIn and Spreaker. The call-in number will be 929-477-3331. We will advertise when we will be going LIVE and placing it on Twitter and Facebook Pages as well. We are very excited to have this new platform and engagement form with you the everyday fans just like us. Nothing is off limits, nothing will be PG or G rated. Rants and raves are accepted and just sports fans being sports fans and sounding off on their favorite teams and national/local sports news. Be sure to join us and call into the new show! It’s going to be a fun ride and this is still the beginning of where we want to take Crossroads Sports as a brand!